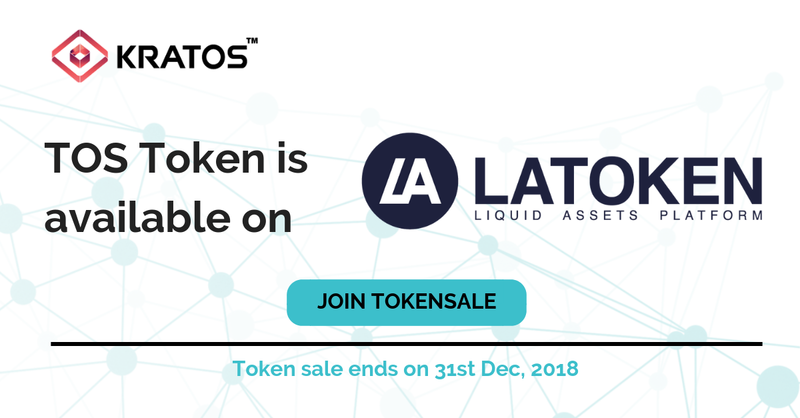 KRATOS™ has announced its token TOS will be listed on LAToken, a rapidly growing crypto exchange focusing on providing liquidity supply for new utility and security tokens. KRATOS™ is world’s 1st Blockchain and Cloud-based hybrid ERP platform to facilitate physical commodities trading on blockchain network. KRATOS™ helps all the stakeholders of the physical commodity trading eco-system by making the trade flow transparent, less complex and more efficient. KRATOS™ is World’s 1st Blockchain and Cloud-based hybrid ERP platform. KRATOS™ aims to transform the physical commodity trading industry, which is suffering from various challenges including the acquisition of trade finance. Despite numerous programs and schemes introduced by several international banks, there is always an increasing gap in trade finance. Other challenges include the involvement of an immense number of middlemen, systematic abuse resulting in mistrust among the trading partners and an increased overhead cost. By using blockchain technology, KRATOS™ promises to make the trading process transparent and more efficient. The Token Curated Registries (TCR) will also help SME’s acquire trade finance and help financiers find reliable and potential trades. Arkratos is a Blockchain lab based in Singapore. We provide end-to-end services related to Blockchain and Smart contracts product development, Tokenomics and Whitepaper advisory. Our Flagship product KRATOS™ is World’s 1st Blockchain & Cloud-Based Hybrid ERP. Built on Ethereum, KRATOS™ works as a decentralized commodities trade and finance platform that uses smart contracts to remove the need for unnecessary middlemen and paper documentation, to enhance transparency and efficiency as well as to lower the cost and time involved in the trade process. Please click here for a free demo of the Product. #Blockchain based Physical #Commodity #Trading Platform. Solving #SCM, sourcing, quality assurance, #TradeFinance, logistics, #shipping, legal & documentation.